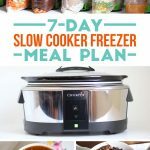 I’ve been thinking a lot about how to make crockpot freezer meals quickly. One of my favorite tricks is to focus on recipes that don’t call for a lot of ingredients. 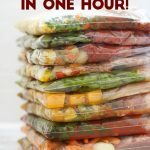 I put together a list of seven crockpot recipes with six ingredients or less and was able to make them in only 30 minutes! Wow!!! 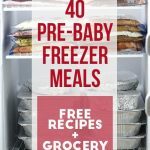 What’s so great about these crockpot freezer meals in particular? They all include fresh or frozen vegetables. They all have six ingredients or less (some only have three!). 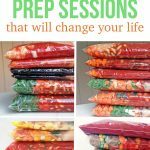 None of them require any measuring – simply dump the veggies, meats, and sauces into the bags and freeze. Since I didn’t have to do any measuring, cleaning my kitchen was super easy too. All I had to do was put my strainer and knife to the dishwasher (I used the knife to get some of the ingredients out of jars) and rinse some cans for the recycling bin. I actually made these meals a few months ago for a blog post on Thirty Handmade Days so we’ve already eaten all of them. They were delicious! The only flop was the beef teriyaki. We cooked in a wok on the stovetop as a quick weeknight meal and it was pretty bland. I went ahead and added our all-time favorite beef teriyaki recipe to the printable doc above because it’s way better. I print the recipes, grocery list, and labels ahead of time and go shopping. When I get home, I leave all of the ingredients out on the counter and set my kitchen timer (if I have a time goal in mind, like 30 minutes). 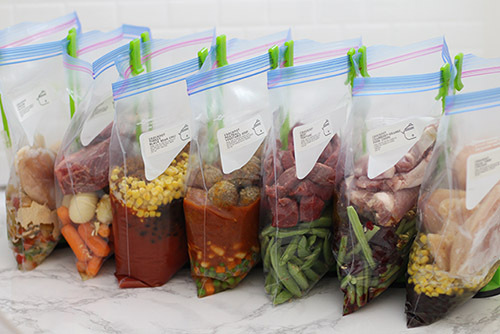 I fill one bag at a time by sticking on its label and layering the veggies and canned goods at the bottom, spices in the middle, and meat at the top. Then I seal all of the bags at once and stack them in the freezer. 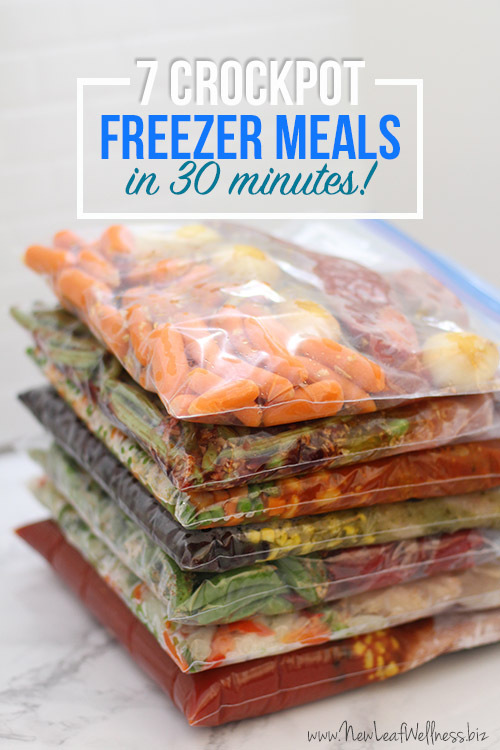 Most freezer meals will last at least three months and we have no problem eating them in that time. 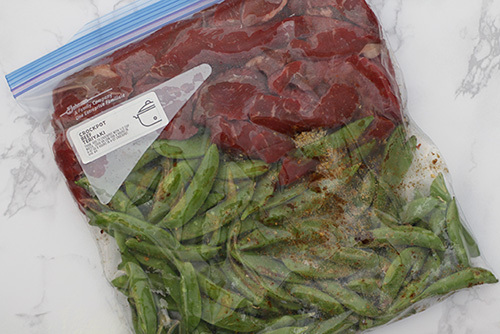 When we’re ready to eat, all I need to do is thaw a bag overnight in the refrigerator or in water in the morning and then cook the meal in my 6-qt programmable crockpot for 4 hours on “low.” Serve with a side of rice or fresh bread and dinner is done! If you have any questions leave a comment below and I’ll respond as soon as I can. I’d love to hear from you. Want to try the Crockpot Beef Teriyaki but am not a fan of peas. What veggie would you substitute? Does it need to be another starch? I think sliced bell peppers would be great. I printed these recipes from the link but they all say to cook for four hours. Is that right? I’m also wondering about the cooking time. I’m away between 8 and 9 hours every day. What would you suggest as far as cooking the meals? I would either use a smaller crockpot (4 quarts) or one with a programmable timer.